Here's a quick post and an even quicker recipe. 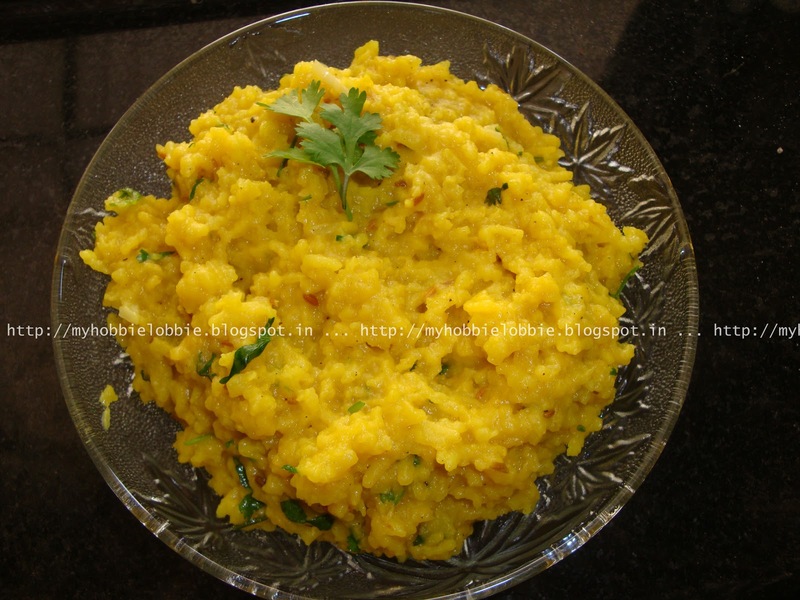 Khichdi is a rice dish cooked in a pressure cooker for about 10 minutes and seasoned in many different ways, depending on which part of the country your eating it in. I've eaten a Dal Khichdi which is a rice and lentil dish and a Paalak khichdi, a spinach and rice dish. I've not yet tried making the Paalak Khichdi at home. If you have I'd love if you could share the recipe with me so that I can try it out too. The Dal Khichdi, however, I've tried multiple times. This khichdi should be served with some aachar or pickle. You could also serve it with a side of salad or yogurt, if you'd like. I've tried a few takes on this and the one that I made a couple of days ago, I think, was my best attempt so far. Wash the rice and the lentils together and let them soak for 10-15 minutes. You can start prepping the rest of the ingredients in the meanwhile. Heat the oil in a pressure cooker and add the cumin seeds and let them sputter, taking care not to burn them. Add the chilly and the onion and saute till the onions are soft and pinkish brown. Tip in the turmeric powder and stir till well mixed. Drain the rice and lentils that have been soaking and add them to the cooker. Stir gently to mix everything. Add salt to taste and 4 cups of water. Stir gently. Cover the pressure cooker and add the stopper. Cook on high flame. After the first whistle, cook on low flame for 10 minutes. Turn off the heat and let the pressure drop on its own. Once the cooker can be opened, add the chopped coriander and stir to mix. Prepare the tempering. In another small frying pan, place the ghee and the chopped garlic. Let it saute gently on low fire till it turns fragrant. Don't burn the garlic as you'll lose all the flavor. Add this ghee and the garlic to the cooked rice and stir to incorporate.